Publication of the 2018 French-American Economic Report – French Treasury in the U.S. The Economic Department of the French Embassy in the United States just published the 2018 France-U.S.A. Economic Report. 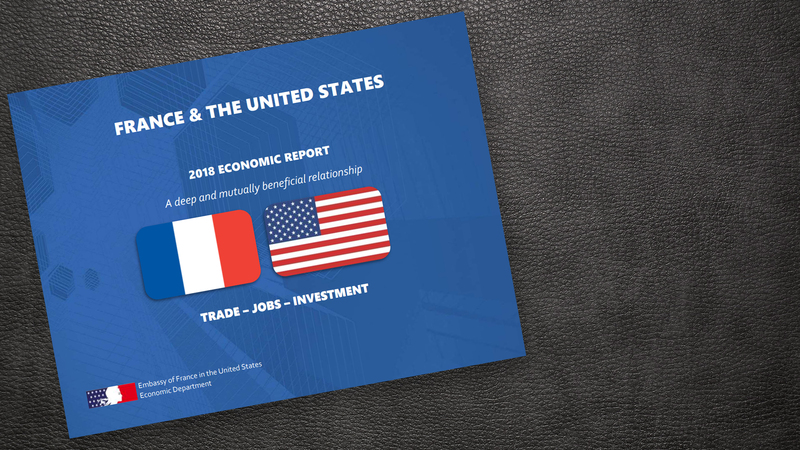 This report shows the strong economic ties between France and the United States through economic data (trade, employment, foreign direct investment) and a mapping of the French business footprint state-by-state. The 2018 edition confirms and surpasses the figures shared a year ago: trade in goods and services between France and the United States reached $139 billion in 2017 (up 16 percent from 2016). In 2017, new FDI by French companies created 50,000 jobs in the United States, making France the fastest growing foreign source of employment in the U.S. that year. French companies are now the 3rd largest source of foreign employment in the United States (678,000 jobs created by 4,800 companies) while U.S. companies are the number one source of foreign employment in France with 481,000 jobs. For this new edition, around forty French companies shared their success story in the United States, illustrating the geographic and sectoral diversity of the French footprint in the U.S. These stories cover fields such as food, manufacturing, pharmaceutical products, tech and services. The report was presented to around twenty U.S. Senators and Representatives at an event organized by the Congressional French Caucus on September 12th at the French Ambassador’s Residence. Members of Congress stressed the depth and balance of the French-American economic relationship and the key role played by French companies in the economies of all fifty states.